... Unlike most pushblocks, the Incra one also has a double-walled ABS hand guard (grey) further protecting your rather valuable tools (hands). I should have known that it would be someone like INCRA that came up with an easy to use, fully adjustable box joint jig that virtually anyone can use. Their INCRA IBOX is a perfect example of how high-end engineering and machining can produce a jig that makes a previously very difficult form of joinery very easy. I like that the same jig can be used on a table saw or router table without buying additional pieces. This way you have options years down the road if your shop changes. INCRA's attention to detail, their penchant for using high-end materials and dead on CNC (computer numerically controlled) machining means that you are getting a quality American Made tool that will last forever. 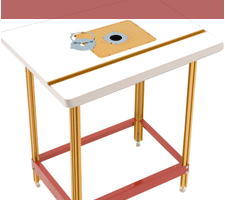 Incra are renowned for creating items that bring incredible precision to woodworking. And the iBox is no exception. Unlike the other box jigs, the iBox has a completely variable finger size to exactly match the size of the cutter. ... The Miter Slider SE from Incra was not only easy to dial into the miter slot on my table saw and band saw it is incredibly smooth in operation. I was able to remove all play between the miter slot and the Miter Slider SE with a simple adjustment to the expandable discs. My table saw jigs will now have no play what so ever between the miter slot and the miter bar... and that gives me the accuracy I'm looking for when it comes to table saw operations. 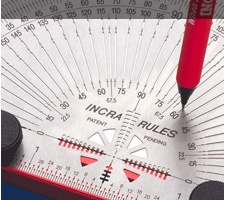 The Incra Mitre Gauges have long represented some of the most accurate mitre gauges on the market... Both these have had the high definition treatment. With a significant advancement in laser cutting accuracy, having V-grooves every 5 degrees is a thing of the past, and now they are every degree... As you can see, the V120 now has significant accuracy, and represents an impressive upgrade to the V27. 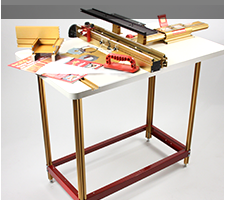 INCRA promotes their table saw and router table line of LS positioning fences as also useful for cutting dovetails and box joints. All that is certainly possible, and they include extensive instructions and ruler templates for doing that. I installed their router table option on the left side of my table-saw so I can slide over the entire LS fence system for router table use as well - slick! Works great for that as well. 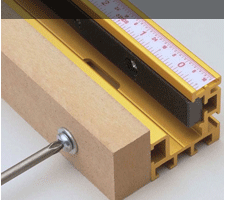 Super accurate measuring and layout tools that make woodworkers of all experience levels more accurate and consistent. 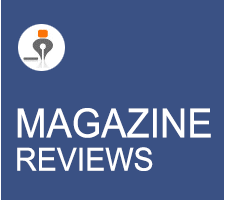 The INCRA tools are also extremely durable, fast and easy to use. The INCRA Guaranteed Squares are impressive from the shockproof box they come in to the Certificate of Accuracy attached to each one, promising accuracy within 0.001" at any point along the blade. The fit and finish of the components is first rate. All edges are smoothly dressed and flat surfaces given a matte finish that eliminates glare. The attention to detail extends to the precisely machined handles, secured to the blade with Allen-head screws, countersunk below the surface...INCRA Guaranteed Squares and results in the remarkable accuracy these tools bring to the shop. If you were to search for squares to use in the woodworking shop what you would find are carpenters speed squares, carpenters framing squares, try, machinists, double, combination, and a line of exceedingly expensive collectors tools. Until now you would not really have found squares optimized for our purposes. It's not that we are in a unique field which requires specialized equipment, it's that the commonly available tools just don't quite fill our needs - until now. 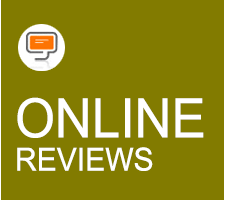 INCRA are well known for making quality woodworking products and accessories. Their miter gauges are some of the best in the business. 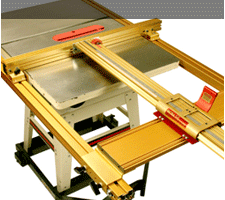 It's very evident that a lot of thought has gone into creating the Miter Express product as it addresses many common limitations of the basic table saw setup. The machining of parts was spot on, and after five weeks of testing this product, I am happy to report that the Miter Express is still a regular real estate occupier of my table saw's cast iron top. Kudos to Incra for a neat and innovative solution to some common table saw problems. 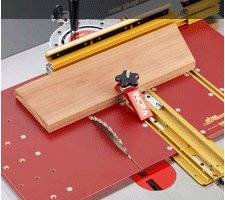 If you are new to woodworking, the Incra system reviewed here is primarily designed as a router table jig. Incra also makes a similar system that can be used as a tablesaw rip fence that can also accept the Wonder Fence for router operations. The positioner can and has been used for a multitude of applications besides these though. If you have never used one of these incremental jigs before, you are in for a treat. It will only take about five minutes of operation to conclude they are the best thing since the invention of the circular saw blade. The Incra LS SuperSystem represents one of the major milestones in modern woodworking accessories. Incra could justifiably alter the ad line from Dupont and say "we don't cut the wood, we allow it to be cut accurately". INCRA Jig Ultra Lite - Today Taylor Design, Chris' company, makes a range of products and product lines, most of which share a common feature ... they can all be precisely adjusted in set and repeatable increments ... and thus the name INCRA. The Incra LS Positioner Super System is extraordinary in its innovating design, quality manufacturing and ease of use. 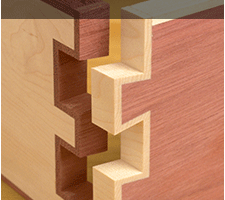 Even the beautiful but intimidating-looking double and double-double dovetails are remarkably easy to make because of the automatic accuracy built into the Incra LS Positioner and its template driven system. If you are looking for a joinery machine that embodies accuracy, flexibility and ease of use, the Incra LS Positioner Super System has few, if any, competitors. I know of no other machine that offers these qualities in such a well made, ingeniously engineered and easy to use package at any price. Relatively late in life I learned the old saw (pun intended) "Measure Twice, Cut Once." I wish these Incra measuring tools had been available at that time because I'm sure my measurements (and cutting) through the years would have been much more accurate. 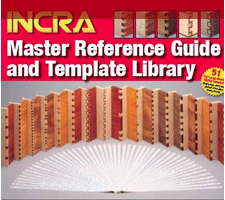 Literally every woodworker I know uses an Incra now, many of them after trying mine out. You should get one too. You'll thank me for it. The TS-III is easy to install and performs exactly as advertised. You will quickly fall in love with the positive action of the racks and the ease by which you will be able to set an accurate, repeatable fence position. The fit and finish was outstanding as there was not a single surface scratch on my unit. 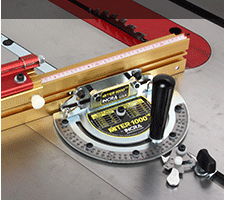 The Incra Miter Express bridges a gap between large cumbersome crosscut sleds and smaller units for detail work. In addition to common 90 degree settings it allows angle settings too. When coupled with an Incra miter gauge, it adds increased accuracy to these angle settings as well. Any sled should make crosscut operations safer. 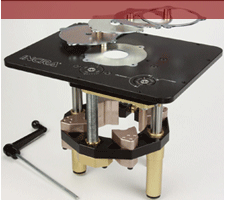 The T-slot design of the Miter Express and stock clamp add even more to the safety aspect. 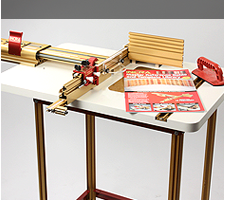 The INCRA Miter Express is another top-shelf idea from INCRA that demonstrates their innovative approach to design and dedication to detail and precision manufacturing. Throughout assembly, everything fit perfectly and despite heavy-duty "playing" in the shop, the Miter Express continues to perform smoothly with spot-on accuracy. It appears that with minimal care, the Miter Express will last and perform accurately for a very long time. The INCRA V27 is an exceptionally accurate, easy-to-use and very durable miter gauge that will be a welcome addition to any power tool with a miter slot. The Incra V27 is a well made tool and a great value. I highly recommend the V27 to two groups of users. Those who cannot afford a more deluxe Incra miter gauge or those needing a good secondary gauge for use on sanders, bandsaws, and the like. I do not recommend the V27 for those who are going to put deluxe cross fences on it as I believe it would end up being more expensive than buying a more deluxe model that already included a fence (like the Incra Miter1000SE). The INCRA 1000SE is an extremely accurate and versatile miter gauge that will improve your woodworking at a surprisingly low street price. Top quality materials and manufacturing insure repeatable precision that means you will make more cuts right the first time and every time after that. You concentrate on the project and not what the miter gauge was supposed to have done. The Incra 1000se is a well made tool and at around $150 it is a great value. I would recommend the 1000se even without the cross fence as it is a remarkable improvement over the miter gauges that come standard with machines. 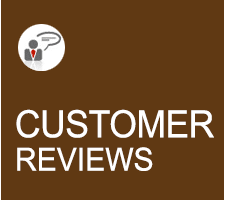 The inclusion of a decent cross fence with a flip stop make the product even more useful and noteworthy enough to earn my "highly recommended" rating. My first impression of this accessory even before it was assembled is something akin to "I wish the rest of my saw were made with this attention to detail, quality, and precision". Part of the normal process of assembling and tuning woodworking machines and most accessories for me involves quite a bit of deburring of edges, lubrication, chasing tapped holes and whatnot. The Incra is a noticeable step above all this as I basically didn't have to do any of these things. 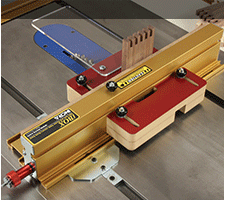 The Incra 5000 Miter Sled is hardly a new product, except for my shop. I have seen it used at shows, and it is clearly one more well designed and executed product from Incra. And, it is a welcomed addition to my shop. It will coming particularly handy in the next weeks as Beth and I take on a number of small box projects.